Previous studies on experimental mouse models have suggested a role of vitamin D in immune system regulation and IBD disease severity. 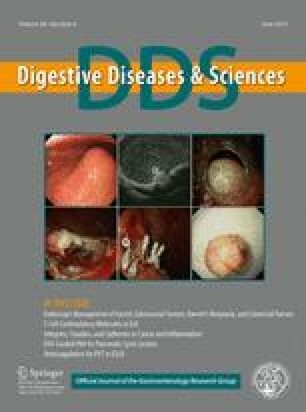 In this study, we examine the relationship between vitamin D levels and clinical disease activity in human subjects with ulcerative colitis (UC). We hypothesized that patients with vitamin D deficiency will display increased UC disease activity as compared to patients with normal vitamin D levels. A cross-sectional study was performed by querying the outpatient electronic medical record of our health system for patients seen in the gastroenterology clinic from January 2007 to October 2009 who carried both a diagnosis of UC and a documented 25-OH vitamin D level within 30 days of their clinic visit. Demographic and clinical variables were collected. Clinical disease activity was calculated using the six-point partial Mayo index. Active disease was defined as a six-point index score of ≥1. Vitamin D deficiency was defined as a 25-OH D level below 30 ng/ml. Data were analyzed using the chi-square distribution test. Thirty-four patients met inclusion criteria (53 % female, mean age 45.7 ± 24.7 years). Fifteen patients had normal vitamin D levels and 19 patients were vitamin D deficient. Twelve patients had vitamin D levels <20 ng/ml. Vitamin D deficient patients were statistically more likely to have increased disease activity than patients with normal vitamin D levels (p = 0.04), with 68 % of deficient patients displaying active disease compared with 33 % in the sufficient group. There was also a statistically significant association between vitamin D status and need for treatment with steroids, with a higher percentage of vitamin D deficient patients (47 %) requiring such treatment compared with 7 % in the sufficient group (p = 0.02). There was no association between season of visit and disease activity. Vitamin D deficiency is common among patients with active UC, particularly those requiring corticosteroids. Further investigation is needed to determine the clinical utility of vitamin D monitoring in patients with UC and whether there is a role for vitamin D as a treatment for UC.